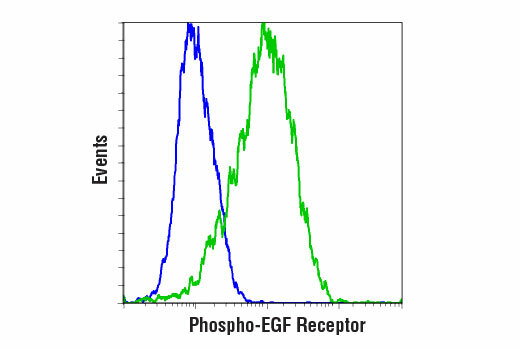 Flow cytometric analysis of serum-starved A-431 cells, untreated (blue) or treated with Human Epidermal Growth Factor (hEGF) #8916 (1 μg/ml, 20 min; green), using Phospho-EGF Receptor (Tyr1068) (D7A5) XP® Rabbit mAb (PE Conjugate). Phospho-EGF Receptor (Tyr1068) (D7A5) XP® Rabbit mAb (PE Conjugate) recognizes endogenous EGF receptor only when phosphorylated at Tyr1068. This antibody may cross-react weakly with other tyrosine-phosphorylated proteins. This Cell Signaling Technology antibody is conjugated to phycoerythrin (PE) and tested in-house for direct flow cytometry analysis in human cells. The antibody is expected to exhibit the same species cross-reactivity as the unconjugated Phospho-EGF Receptor (Tyr1068) (D7A5) XP® Rabbit mAb #3777.